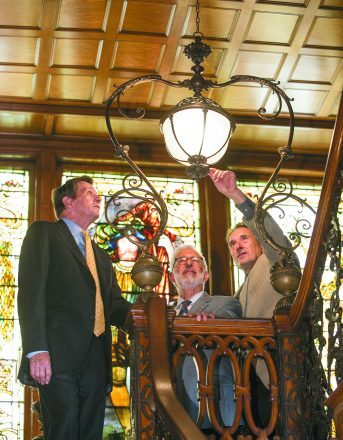 Bud Liebler, Jim Newman and Andy Levin look at lighting that will become more energy efficient with LED bulbs. When it comes to saving energy in Detroit, a green movement to provide businesses the up-front capital they need to seal leaky windows, install new heaters and coolers and even put up some solar panels is picking up PACE. 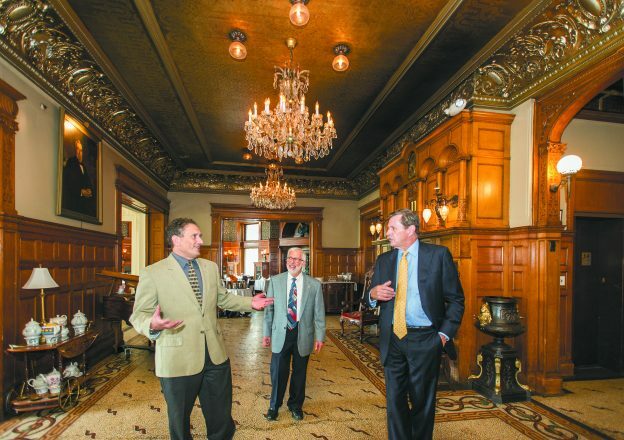 In the first project of its kind in Wayne County, the David Whitney House and destination restaurant enlisted in a private-public financing program called Property Assessed Clean Energy (PACE) to upgrade the building’s heating and cooling systems, update storm windows and rekindle its opulent chandeliers with LED lighting. PACE is a long-term financial tool that helps companies and building owners pay for much-needed energy upgrades without digging into capital expenses. Michigan passed PACE-enabling legislation in 2010 and the state has two active PACE programs, one in the city of Ann Arbor and Lean & Green Michigan, based in Detroit, that serves 23 counties and 11 municipalities/townships statewide. Through Lean & Green’s PACE program, over the next 20 years, the landmarked 19th-century house will save more than $2 million in energy costs and eliminate 232 metric tons each year from Detroit’s carbon footprint, the equivalent of 246,994 pounds of coal each year. And, come this winter, instead of patrons seeking a warmer table away from drafty windows, the only chill they may feel is from the passing of David Whitney’s ghost. While the Whitney may be the highest-profile business to enroll in PACE, Andy Levin, founder and president of Lean & Green Michigan, and dozens of energy-efficiency consultants such as Jim Newman, who led the Whitney project, have completed projects in other nearby counties and say other businesses are starting to take notice. In 2018, Levin expects to close on more than a dozen PACE projects to the tune of $10 million. He and Newman have collaborated on the Whitney project with Liebler. Planning was in place this summer; the physical work begins this fall; and the project should be completed by the holiday season. Although the current White House administration under President Donald Trump is rolling back many Environmental Protection Agency regulations, Levin said the wheels are already turning locally as corporations realize the economic benefits of cutting greenhouse gas emissions. “Every PACE contract reduces Michigan’s carbon footprint,” Levin said by phone as he grabbed lunch between meetings with potential contractors and PACE clients. Though he founded Lean & Green Michigan in 2013 as part of his Detroit-based Levin Energy Partners, his quest for a greener planet goes back further and is directly linked to his involvement in the Jewish community here and in other parts of the country. In the early 2000s, he protested oil drilling in the Arctic Circle with a Reconstructionist temple in Bethesda, Md. 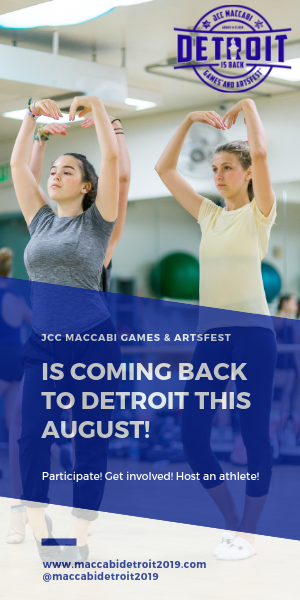 Now serving as president of Congregation T’chiyah in Oak Park, he is also founder and chair of the steering committee of Detroit Jews for Justice. It was only natural for Levin’s longtime associate Jim Newman, owner of Newman Consulting Group in Farmington Hills, to become one of the many PACE contractors now available for hire in Michigan. Newman is a self-made energy-efficiency guru sought after for his knowledge in areas such as indoor air quality and sick building syndrome. He has been developing his expertise ever since the 1970s Arab oil embargo. Newman said his career has taken him on speaking engagements and projects as far away as Dubai and as local as Temple Kol Ami, where he headed Kol Ami’s LEED Certification project. He also served on the board of the Michigan Coalition on the Environment and Jewish Life and on Oak Park’s beautification commission, helping the town turn a profit on its recycling program. According to Newman, one of the biggest culprits to climate change and to a company’s bottom line are buildings that leak energy. Businesses know it; but it’s hard for them to justify forking over large sums of money for long-term energy efficiency when many are concerned about quarterly profit margins. Just as he does on the job, Newman walks the green walk in his Farmington Hills home. The boiler room in his basement contains a heating/cooling system that brings outside air directly into the home’s heating and cooling system to ease the workload of the furnace and boiler in hotter and colder months. Never tiring of learning new methods and technologies for a healthier planet, Newman describes his long career as a “restless, creative process” of guiding industries on better energy-use practices that are beneficial in multiple levels. 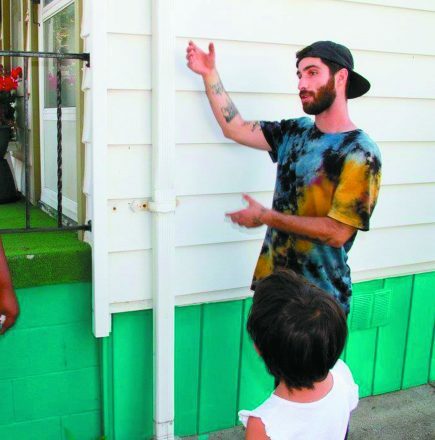 Property Assessed Clean Energy (PACE) is a financing mechanism that enables low-cost, long-term funding for energy efficiency, renewable energy and water conservation projects, according to PACENation.us., a national advocacy group. PACE financing is repaid as an assessment on the property’s regular tax bill for up to 20 years, and is processed the same way as other local public benefit assessments (sidewalks, sewers) have been for decades. PACE financing may stay with the building upon sale and is easy to share with tenants. PACE is a national initiative, but programs are established locally and tailored to meet regional market needs. State legislation is passed that authorizes the establishment of PACE programs. Levin, Newman and Liebler expect the David Whitney House project to be finished by the holidays. 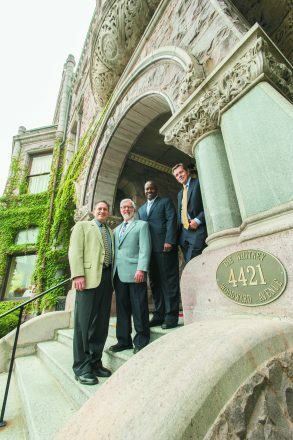 Andy Levin, founder/president, Lean & Green Michigan; energy efficiency consultant Jim Newman; Tupac Hunter, executive director of government initiatives for Wayne County; and Bud Liebler, owner of the David Whitney House and destination restaurant. When barrels of Mediterranean olives and pickles reach American shores, they could wind up in landfills — or they can have a second life saving water and keeping our Great Lakes clean when they are repurposed into rain barrels. Joshua Rubin of Farmington Hills wants more Detroiters to “disconnect from their downspouts” that send storm water down the drain and overtax our sewers, lakes and rivers. Instead, he advocates storing the water in the rain barrels he designs for his company, MiRainBarrel.com. Rubin comes from a family of barrel makers. His great-grandfather Charley Rubin founded Detroit Beer and was once a wooden barrel cooper who distributed barrels to bootleggers from Windsor to Chicago during Prohibition. Seven years ago, Rubin began working with food manufacturers to collect empty 55-gallon drums, fit them with nozzles and openings for downspouts and sell or give them away across Metro Detroit. In 2016, he partnered with the Sierra Club Great Lakes Program and the Detroit Riverfront Conservancy to create a scholarship to give away rain barrels to deserving organizations and urban farms in Detroit. 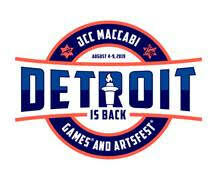 This summer, he showed off his products at the Michigan Jewish Food Festival at the Eastern Market. The MiRainBarrel brand centers around easy-to-assemble rain barrel kits. In the seven years he’s been in business, Rubin also has developed products such as compost tumblers and vertical gardening containers. Each product is designed with conservation in mind and helps fulfill the company mission of providing customers solutions to live more environmentally sustainable lives. 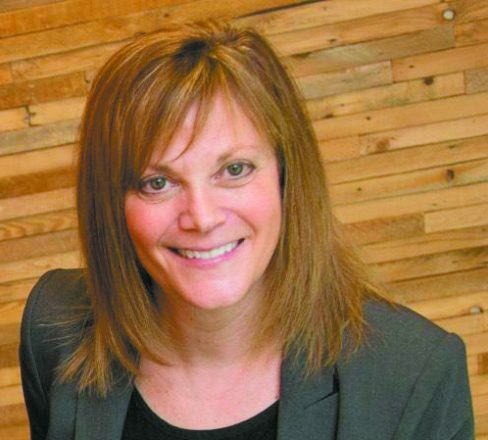 Whether teaching courses as she did in the past at Lawrence Technological University in Southfield or guiding clients on projects as principal partner at DesignTeam Plus & Team4Community L3C in Birmingham, Shari Stein has always worked at keeping renewable energy solutions and sustainable architecture practices at the forefront of each new project. Stein and her design and architecture team are committed to creating healthy environments with consideration to universal design principles and sustainable materials. The award-winning firm’s projects include one brewery in Boyne City in an old railway station and another in Lyon Township using repurposed plaster lath and barn siding. The firm also designed the greenhouse at Yad Ezra in Berkley, and has joined the “little house” housing trend by repurposing shipping containers into affordable housing. All the while, Stein guides clients on the benefits of simplifying one’s lifestyle to get by with less. Through function and form, Stein said her firm uses the most conservation-conscious materials possible, from repurposed hardwoods to recycled glass, bottle caps and metal as well as paints free of volatile organic compounds. According to Environmental Protection Agency estimates, approximately 3 million tons of office furniture and furnishings are discarded each year. Statistics for 2005 estimated that 8.8 million tons of furniture ended up in U.S. landfills. It’s so poorly monitored that there is little data. That’s where Ed Chudnow, president of Better Business Systems Group in Ferndale, steps in. 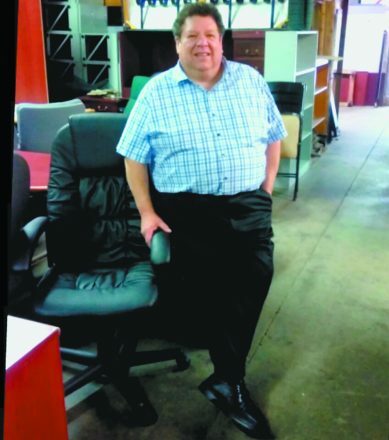 For more than half a century, Chudnow’s family business has been salvaging desks, file cabinets, chairs and other office equipment from the downsizing of corporate America and refurbishing and reselling the stock to small businesses and start-ups. In the 1980s, the company carved a niche market for itself by outfitting special events, starting when Detroit hosted the 1980 Republican National Convention. These days, the bulk of his merchandise comes from companies needing to rid themselves of desks and cubicles as workplaces become more fluid and mobile. He recently sold used office furniture to places like the Detroit Zoo and Atomic Chicken in Detroit.